This week has been pretty miserable here in London. I had to go on the train to work instead of cycling because it has been raining all the time. Good news though, it is starting to warm up a bit and there are very small signs that Spring is on its way. You may have seen from my January healthy lifestyle post that I have been trying to eat breakfast. I've always struggled to eat before 11/12 o clock so I've been having a few yummy meals to try and get myself to eat breakfast. One of my favourites so far is homemade guacamole on toast. I mash up 1 avocado, chop two tomatoes and add the juice of 1/2 a lemon, season with salt and pepper and there you go! This breakfast works out at around 450 calories and keeps me feeling full until lunchtime. I've also been loving spinach and cheese omelettes which are around 300 calories. I feel I have settled into a routine with my no fuss minimal makeup routine. I wrote a blogpost here with all the products I am currently loving on a daily basis. I also wrote a blogpost about my top 3 most worn nail polishes. These are all shellac polishes which I do myself at home and last two weeks without chipping. I wrote all about how you can achieve these at home without paying the nail salon price tags. 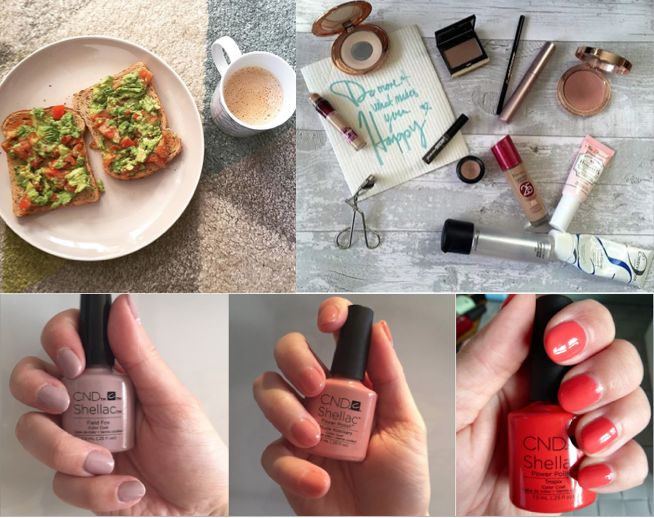 These polishes are cheaper than OPI, Zoya, Smith and Cult and Nails Inc, definitely worth checking out if you hate painting your nails every few days. I haven't really ventured out much this week as the weather has been so rubbish, I'm really looking forward to my Spain holiday- 2 weeks and counting!